Home » Android » Building Android and iOS Apps with React-Native in 5 Minutes. Building Android and iOS Apps with React-Native in 5 Minutes. If you haven't read the previous post, Then head straight for it here, Why I Moved from Ionic to React-Native for Android and iOS Development, It will help you understand and appreciate the simplicity and the reason Framework matter in Mobile app development. Now, We will design a mobile app for Android and iOS with React-Native in 5 Minutes. This app will run on both Android and iOS Devices, As go further in React-Native tutorial series, The magic in React-Native will reveal itself. We will demonstrate how to earnest the power of native module to create a robust Android and iOS app using React-Native. There are some software needed before an Android or an iOS app can be launched, To run Android app we need to download and Install Android Studios here. Running React Native app requires Node installed on your computer, Head to Nodejs Download Page to download and install the version that is suitable for your computer. Before you continue, Remember to join our Developers group by subscribing to our notifications list, to no miss out on latest tutorials on how to develop Interactive and Powerful and Interactive Mobile Applications. 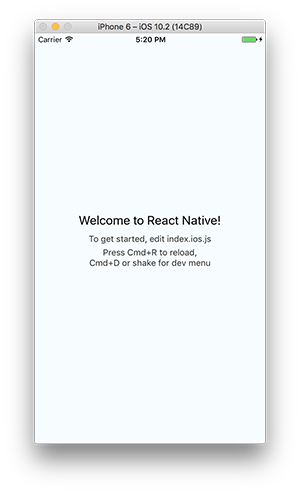 Hopefully, Android studios and Node has been installed as suggested above with no errors if you encounter any error while installing any of these products visit Getting Started with React Native for more instructions. If the command above executed successfully, We are good to create a new React-Native Project but if you encounter an error while executing the command make sure you have an active internet connection and retry and make sure you follow the React-Native Getting Started Page carefully. This will bootstrap a fresh React-Native project in a directory named after the project name. This command will run the app on any connected device or an existing emulator. If you follow all the instructions well, Something similar to this should appear on your screen.